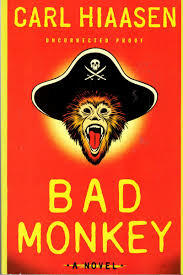 Bad Monkey by Carl Hiaasen was a fast-paced and entertaining novel based in the author's home state of Florida as well as in the Bahamas. Probably 10% of the books I read are fiction, but always look forward to new iterations of Hiaasen's humorous tales of greed, corruption, environmental pillaging and other outlandish behavior. The last one of his I read was Star Island back in 2010 and I tend to agree with the recent New York Times review by Janet Maslin that Bad Monkey a superior book. I particularly liked from Maslin's review her riff on Hiaasen that "his books are built of balsa wood, but they are beautifully constructed all the same. And if they call for more comic distraction than honest emotion? Forget it, Jake; it’s South Florida. The truth is always stranger than fiction." I also find interesting about Hiaasen that he writes a weekly column for the Miami Herald as I'd guess he doing quite fine financially because of his books, and presumably enjoys writing the column.